They say that crime doesn't pay. Well, that might be true but in The Strangers, a lack of a payday won't stop these folks from coming to call. Did you see The Strangers when it first came out? Watching the classic home invasion struggle was bone-chilling enough but then the trio of characters had to be wearing these weirdly cheerful masks. Why did they have to do that to us? Now we can never answer our door ever again. This licensed dollface mask is made out of hard plastic and has an elastic band around the back, securing it to your face. 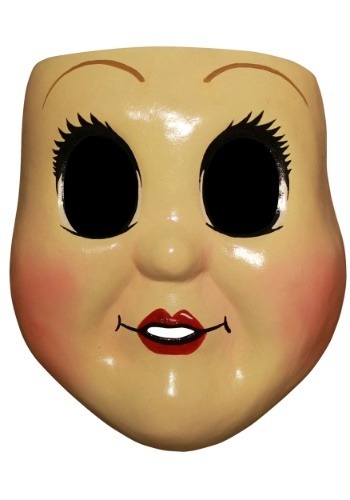 The huge eyes and cartoon mouth is designed after the Dollface character that spreads terror in the trailer park from the horror movie The Strangers. Are you ready to become part of the hit fear riling trio? While none of these characters are a barrel of fun, we would say the faux innocence of dollface is the most personable. She's the voice of the three creeps. Which is to say, she's the spokesperson of the crew. Now, if only she had used that voice to veto terrorizing families and convinced her good buddies to go to the movies instead.